Steelers Accuse Patriots With: Failure to Communi-gate | NFL News, as it happens, when it happens. Your one stop shop. The National Football League season has finally returned. New England fans eagerly packed into Gillete Stadium to witness the celebration of a championship season and hopefully the start of another. The reigning and defending Super Bowl Champion New England Patriots defeated the Pittsburgh Steelers on September 10th and despite a close score of 28-21, it was never really that much of a contest. First and foremost, Running Back Dion Lewis looked incredible in his official Patriot’s debut. Lewis had such a strong showing that even a late goal line fumble could not deter this burgeoning superstar’s night. Malcolm Butler proved that even though he is not the caliber cornerback that Darrell Revis is, he is definitely no slouch either. Butler covered the NFL’s number one ranked wide receiver Antonio Brown last night quite admirably. The OffenIsive line held up well despite the absences of centers Bryan Stork and Ryan Wendell. Quarterback Tom Brady was terrific, and with the help of tight ends Rob Gronkowski and Scott Chandler scored four touchdowns and earned a passer rating of 143.8. The reigning champs were really cooking on all four burners; they even decided to cheat by placing the radio version of the football broadcast into the Steeler coaches’ headsets. Wait, what? If you are confused and in total disbelief by the latest allegations that the New England Patriots have cheated then you haven’t been paying attention. In a world where The Patriots admittedly cheated in 2007 and are accused of cheating in the debacle known as Defaltegate in 2015, it should come as no surprise that a loophole has been created for any team willing to leave their dignity at the door. The Pittsburgh Steelers played like absolute garbage juice and it showed on the field but they had an ace up their sleeve (thanks to Roger Goodell, ESPN and Sports Illustrated. On Tuesday, September 8th, both ESPN and Sports Illustrated coincidentally released horribly defaming articles filled with unsubstantiated circumstances and allegations about the New England Patriots ranging from 2001-2007. Goal Line Gazette columnist Bob Snowdon covered these two articles here https://goallinegazette.com/2015/09/08/new-england-patriots-espn-the-nfls-propoganda-machine-strikes-again/ in great detail so If you missed it please take a gander. With ESPN focusing on Spygate and the cover up and Sports Illustrated delving into every urban legend about the Patriots and their supposed cheating ways, it isn’t surprising that the Steelers took their opportunity to play the cheaters card. Let the excitement commence, after nearly a whole week we have new “gate”, call it Radio-gate, Headset-gate, Communi-gate or more accurately Sour Grapes-gate. Now legitimately there was interference on the coach’s headsets but there are two major factors that are being ignored in order to perpetuate the dishonest folklore thrown on New England’s football team. To start, both coaches received interference on their headphone sets as Gillette Stadium is known to do, putting both teams at a disadvantage. 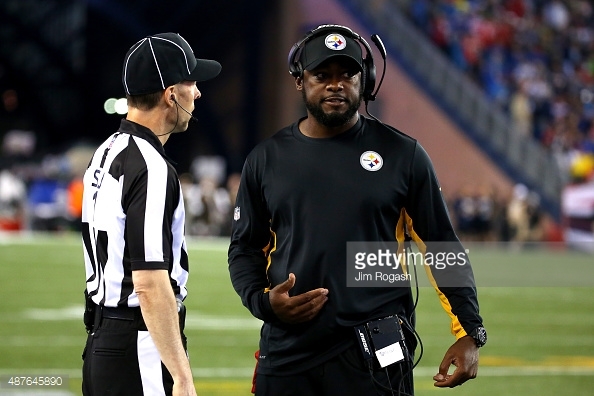 In full disclosure, The Pittsburgh Steelers have insisted VIA their website that their head sets cleared up once the officials went to check the Patriots head sets. The Steelers want us to believe The Patriots stopped fiddling with their feed once the “authorities” were called to investigate. The Steelers accusation would be plausible if The Patriots were responsible for the head set communications at Gillette Stadium. Sorry conspiracy theorists, the National Football League is responsible for all headset communications. In the League’s defense they did come forth and validated that they and they alone, are responsible for headset transmissions. When questioned about the headsets after the game by reporters, Coach Mike Tomlin made it very clear that he was upset and this type of thing always happens in New England. To make matters worse, later in the evening the Patriots conducted a legal goal line shift which caused the Steelers offense to jump off sides. Pittsburgh Quarterback Ben Roethlisberger was very upset and was seen pleading with officials, later during an interview he implied that it was something he knew New England had used before but was unsure if it was legal. 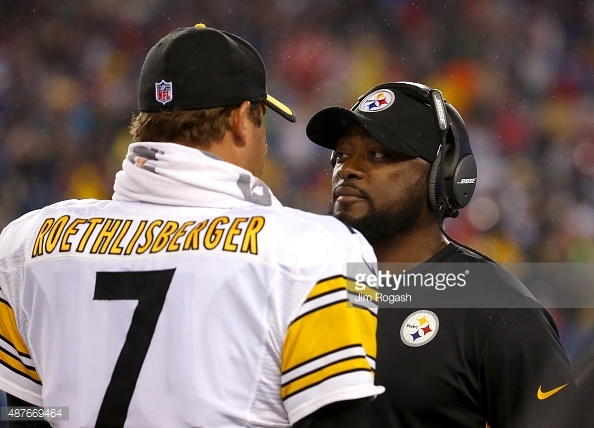 So both Coach Tomlin and his Quarterback are blatantly calling the Patriots out for cheating in two circumstances in which they had done nothing wrong. In essence, this is the work of a cowardly team that didn’t have the guts to say that they played poorly but instead took a ride on “easy way out” train. The Indianapolis Colts may have started this whole mess but at least they owned up to the fact that the Patriots were the better team during the AFC championship. The Pittsburgh Steelers will unfortunately have to play fifteen other teams this season who are not in the middle of cheating controversy, so it will be interesting to see what excuses they decide to use for their overall ineptitude.